Hello there cookie eating friends (that should include about everyone! )– I know. I know. It’s traditional to put raisins in oatmeal cookies. But any recipe that calls for raisins, automatically gets currants substituted in, as far as I’m concerned. Currents are good (raisins just too darn smooshy). But dried apricots, even better. And I happens that I have piles of dried apricots because I mentioned in class that I like them a lot and my little 3rd graders brought me bags of bags of those things for teacher appreciation day!! I’m all stocked up! So anyway, all that to say, I think you’d love this crispy, tender, apricot-y little cookies. With an electric mixer beat together the butter, brown sugar, white sugar and the eggs. Then mix in the flour, salt, baking powder and oats. Finally beat in the cereal, walnuts, apricots and chocolate chips. 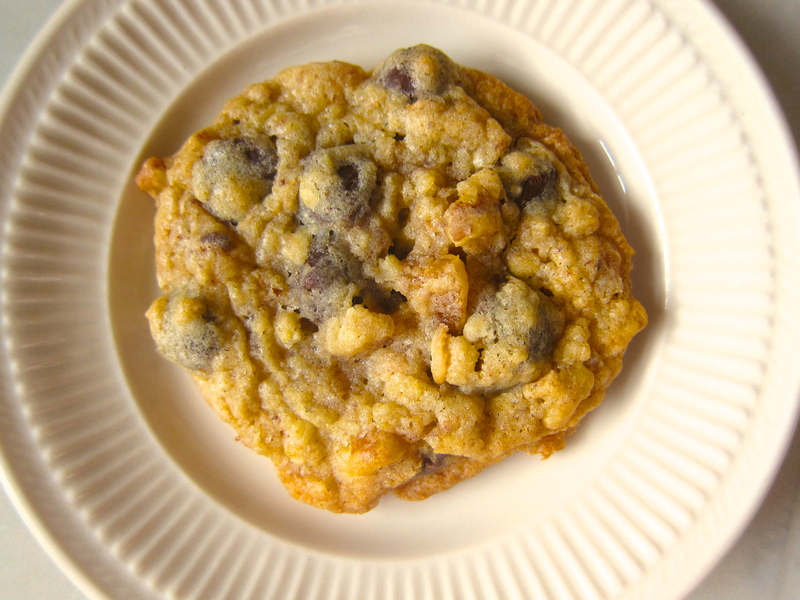 Drop blobs of cookie dough with a spoon onto a cookie sheet sprayed with cooking spray. 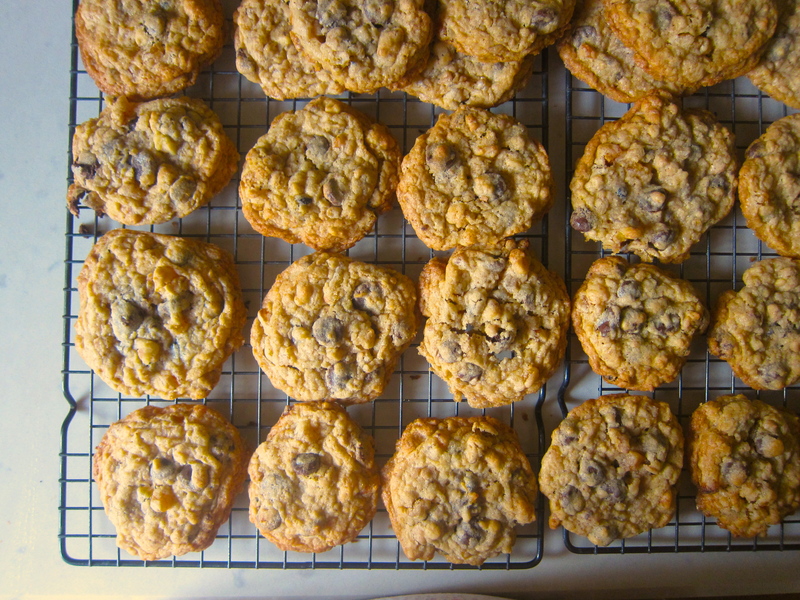 Leave about 1 1/2″ between cookies because they do spread! Bake them up at 35- degrees for about 12 minutes until the a browned and crispy around the edges. Eat at least one hot from the oven. You know that’s when they are best! *If the butter is coming straight from the fridge, microwave to 7 or 8 seconds to soften it just a bit. **Any flaky cereal works– like corn flakes or raisin bran or even granola. No cheerios or sugar smacks!!! ***I like the Hershey’s dark chocolate chips because they are nice a rich and oversized to make the cookies prettier. 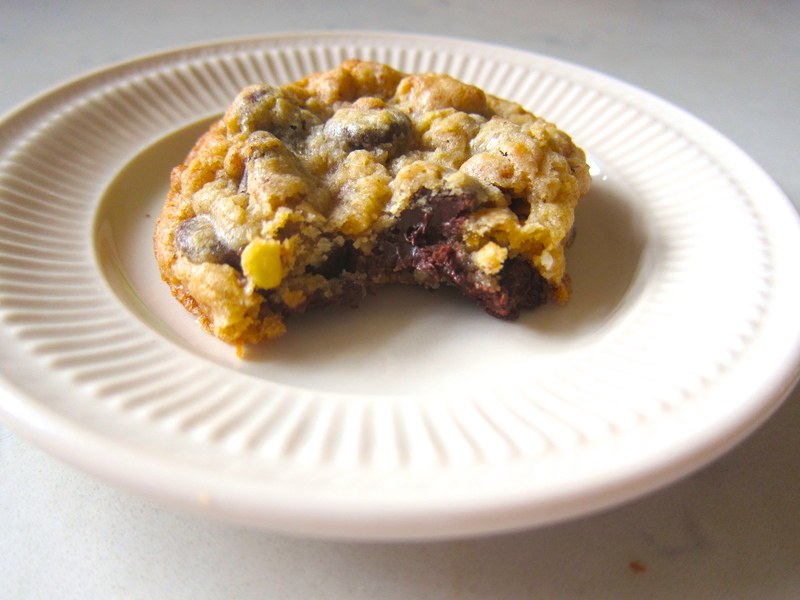 This entry was posted in Food and tagged apricots, baking, chocolate chips, cookies, oatmeal. Bookmark the permalink.